"Love to pray. Take the trouble to pray. Prayer opens your heart until it is big enough to hold and keep God. 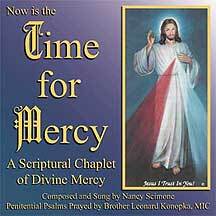 We must know Jesus in prayer before we can see him in the broken bodies of the poor." "To pray the Rosary for children, and even more, with children, training them from their earliest years to experience this daily pause for prayer with the family ... is a spiritual aid which should not be underestimated." Holy Thursday Poster "I am the bread of life..."
Good Friday Poster "For God so loved the world..."
Easter Poster "I am the resurrection..."
GIFT IDEA: Donate the Ultimate Prayer Bundle to your parish to establish a solid prayer foundation for the next generation. Download a sample of the Watercolor Slide Show. Note: to substitute Spanish or Latin Bookmarks for English - call us at 888-652-9494. 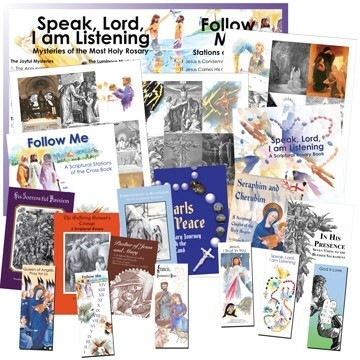 This Scriptural Rosary prayer book presents the richness of the Sacred Mysteries of the Most Holy Rosary in terms that children can visualize and understand. 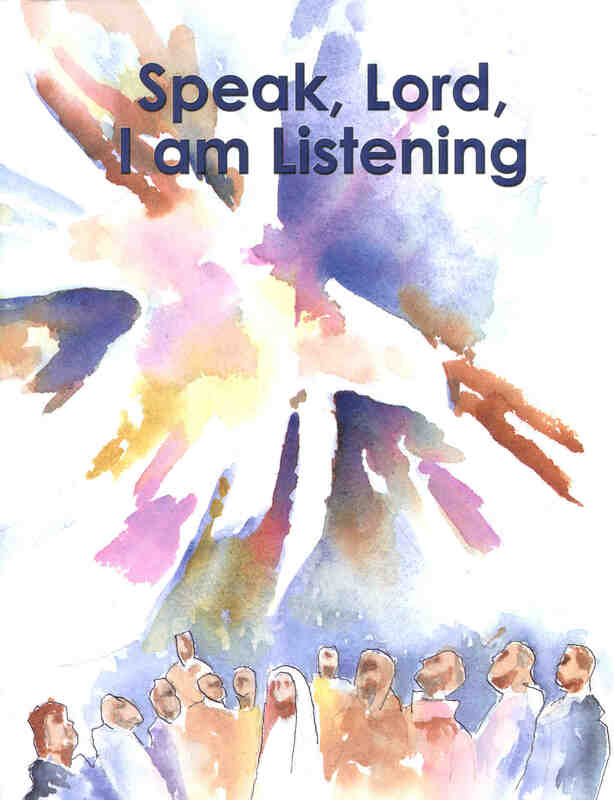 Front of Bookmark: Includes a collage of pictures from Speak, Lord, I am Listening. Since we do not have a church yet (our school actually shares our gym with the parish), we do Stations twice during Lent. Of course, students are encouraged to attend Stations in the evening at their own parishes. Since we don't have church, we do not have Stations on the walls and we cannot have the students walk from station to station. So, projecting the images seems to work best for us. We split our student body into two separate groups (we have a student population of approximately 600). We have K-4 come together and 5-8 come together. We do have a built in screen to project on to. Teachers took turns reading the text from the book. I distributed the bookmarks to the students. Faculty members thought the pictures were very appropriate and beautifully illustrated. I also received many comments on including the information on contemporary saints. I think the students liked that part also. 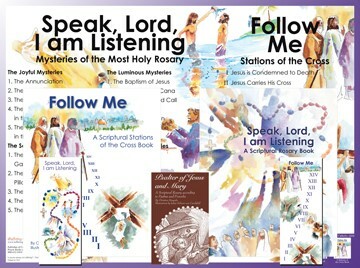 Inspired watercolors and selections of God Word introduce children to the suffering of our Savior Jesus Christ by walking each step with Him to Calvary. Along with each station is a heroically holy person who epitomized self-sacrifice. 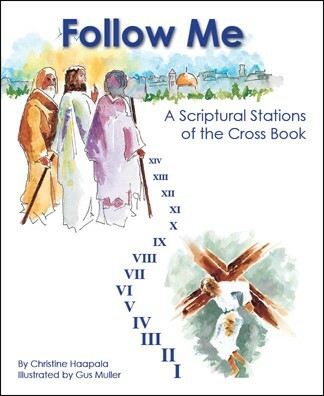 Front of Bookmark: Includes a collage of pictures from Follow Me. ($32.40 when products sold separately. Over 40% savings. Habla, Señor, Yo Te Escucho (A Scriptural Rosary Book in Spanish) Special Note: This book is currently printed in Black and White.